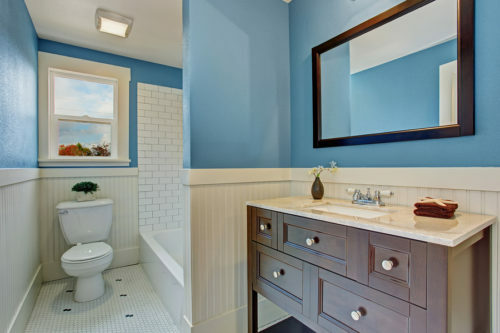 Having a small bathroom is an unfortunate reality many of us have to deal with, whether it’s your primary bathroom or a guest bath. It can be really simple to get discouraged about redoing your bathroom when you don’t feel like you have enough space to execute your ideas. Indeed, a small bathroom can seem like a lost cause at times. But you don’t need to get totally discouraged. The number one thing you can do to make a small bathroom bigger is focus on storage. The more places you have to put your items, the more space you’ll have free. Which makes the space feel less clutter and more comfortable. So let’s get creative about where you can look for storage in your small bathroom. If you have the space, this is a very stealthy place to sneak some extra storage out of your bathroom. A shelf above the door can hold baskets full of items or extra towels. An extra shelf never goes to waste in a small bathroom. 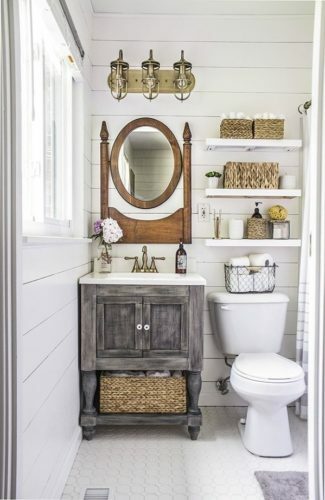 Wicker baskets are a great way to hide a few things away in your bathroom. Wicker boxes are easily stackable and inexpensive! Spice racks can hold multiple items at once, which really comes in handy in a small space. Try mounting two or three spice racks on the wall beside your sink. You can easily store all your lotions, soaps and scrubs in the shelves. The best part about using a spice rack is it empties up all of your counter space. This helps to make your bathroom look bigger. The back of your door makes a great place for an extra towel rack if you’re low on space! Or you can get a hanging shoe organizer and store extra items in the back. Normally Lazy Susan’s are associated with serving a bunch of guests in your home. Lazy Susan’s can also be very useful in adding storage in the bathroom. Look for a lazy Susan with multiple shelves. You can store your towels. Cologne and face cream on here for easy access. If you can’t find a lazy Susan, a small dresser will also work. Anything with multiple shelves, drawers or area for storage will make your small bathroom appear bigger. Windows allow natural light to enter and open up the room. Windows are your only shot at making your bathroom look bigger! Do yourself a favor and don’t block your window with accessories of a table. A mirror is another accessory that will help to open up your bathroom. Make sure you go as long and as wide as possible with your mirror. It will help to open and brighten your bathroom design. What do you use in your bathroom to keep it organized and make it seem more spacious? Share with us below! Mirrors always help in crowded place 🙂 If you’re doing a remodel, you could perhaps go for slightly mirrored tiles as well, with more shine on them. Since storage space is always in demand, I also suggest one of those bathtubs that have shelves on outer sides, very convenient!